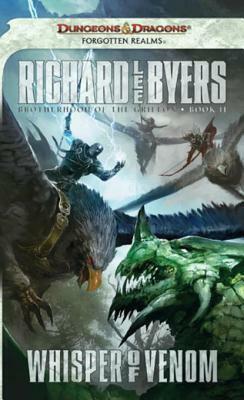 Whisper of Venom by Richard Lee Byers- This is the second book in the Brotherhood of the Griffon trilogy. The first book is titled The Captive Flame and the third book is titled The Spectral Blaze (due out in June 2011). Whisper of Venom is set in the Forgotten Realms campaign setting of Dungeons and Dragons. Richard Lee Byers has written a number of books, mostly focused on the horror genre; Deathward, Fright Line, The Vampire's Apprentice, Dark Fortune, Dead Time, The Tale of Terrible Toys, and The Tale of Gaia and Uktena: Werewolf, 5. He has a collection book titled Dark Kingdoms. He's also contributed a number of stories to other series including; Nightmare Club (Joyride, Warlock Games, and Party Til You Drop), World of Darkness (Caravan of Shadows, Netherworld: Vampire, On a Darkling Plane, and Wraith: The Ebon Mask), a X-Men novel titled Soul Killer, and a Warhammer novel titled The Enemy Within. His also written a trilogy for the Scarred Lands called Dead God trilogy (Forsaken, Forsworn, and Forbidden). He has written a number of Forgotten Realms novels as well; a novel and a short story in the Sembia: Gateway to the Realms series (the short story is found in the first book of the series, The Halls of Stormweather, and the third book, The Shattered Mask), wrote a novel in R. A. Salvatore's War of the Spider Queen series called Dissolution, a novel in The Rogues series called The Black Bouquet, The Year of Rogue Dragons trilogy (The Rage, The Rite, and The Ruin), a book in The Priest series called Queen of the Depths, and The Haunted Lands trilogy (Unclean, Undead, and Unholy). He's also contributed a vast amount of short stories to various anthologies. Whisper of Venom was released in November 2010 and published by Wizards of the Coast, Inc.Aoth Fezim runs the Brotherhood of the Griffon mercenary who are currently in Chessenta helping the country repel an invasion, along with the task of finding the country's long lost ruler. After sending two of his best lieutenants, a mage named Jhesrhi and an archer named Gaedynn, to recover the ruler, they succeed. After bringing back the red dragon Tchazzar, the people of Chessenta rejoice. During this, another member of the Brotherhood, the dwarf Khouryn, is in the neighboring Tymanther helping the dragonborn of the country stop an invading force of ash giants. However, that's not all the dragonborn are concerned with. A cult of dragonborn who are worshipping Bahamut (a dragon god) has sprung up. But something isn't quite right about the cult, and Medrash (a dragonborn paladin of Torm) has his clan-brother Balasar try to spy on the cult. Khouryn's and Medrash's hunch may be more dire than they thought. Between the attacking ash giants and the cult, can Tymanther survive? After Tchazzar arrives back in Chessenta, something isn't quite right with him. The red dragon declares himself a god and begins to do odd and unusual things. After sending the Brotherhood to help break a siege in Luthcheq, the red dragon was supposed to come and assist, however he never shows. Instead, the Brotherhood has to take matters into their own hands. What has happened to the once fearless Tchazzar?Criticisms:1) Reintroduction. The biggest issue with Whisper of Venom was the lack of reintroducing who was who and what was happening. Even though the previous book, The Captive Flame, was released seven months ago, it was hard to recall some of the people and what was going on. The book needed just a bit more background on some of the things, to help refresh one's memory. This is especially important because a lot did happen in the previous book and keeping track of the names and happens was difficult to do at times. An unfortunate side effect of not knowing what's going is that the story comes across as a little slow in the beginning, and only in the beginning. However, it does pick its pace back up quickly. But even so, it shouldn't have been this hard to recall the characters and events that lead up to this book. The lack of mentioning some of the elements in the previous book did hurt the pick up and understand what was happening factor.Praises:1) Characters. Even with the rough start, the characters really do shine through. Everyone was interesting, well-developed, and seemed to mature in some way as the story progressed. There were some characters that weren't as good as the others, examples being Khouryn and Balasar. These two didn't really change or grow as much, but it didn't feel like that mattered. However, everyone else was just fantastic. From the main cast of characters to the bit-players and new characters, they all felt like they belonged and had something important to give the story. Aoth really grew during the story. You could tell that he really cares for his friends and seems to be in love with a priestess of Amaunator, Cera. With Tchazzar, you can see his madness and you can quickly understand that something about him isn't quite right. We also see the dragonborn paladin of Torm, Medrash, coming to terms that following a good dragon god may not as bad as he thinks and that Torm and Bahamut may not be so different. Aoth's companions, Jhesrhi and Gaedynn, felt like the most development. With Jhesrhi we see that she's going into a transitional phase, with coming to grips with what she feels and how things are changing for her. She was probably my favorite character in this book. A close second is Gaedynn, who is going though almost the exact some things, but is taking a different approach it them. It's almost as though he doesn't want things to change. Subconsciously he says things that he doesn't mean, reinforcing the fact that he doesn't want to acknowledge these changes. All in all, the main group of characters were the major highlight of Whisper of Venom.2) Story. The story is written very well. The story easily blends together multiple plot lines without causing confusion. The multiple plot lines never really felt like they didn't belong in the same story. Instead, early in the reading you get a sense that they are somehow connected. Also, the switching back and forth between the two major plots were fit in almost seamlessly. The transitions were surprisingly smooth. The story itself, was plain exciting. After the rough start I had, I could barely put this book down. It was interesting to see how everything worked together; the internal religious battle the dragonborn were going through, the war with Threskel, and the intrigue of Tchazzar returning to Chessenta. Everything just seemed to work perfectly. When something was happening, it always felt like it belonged. All in all, Whisper of Venom was an exciting story and very hard to put down.3) Pacing. The fast pacing was one of the main reasons why the story was exciting. Sure, the beginning was a little rough, but it still read surprisingly well. Also, the story never really relied on fights to make it quick, in fact the fights seemed to be drawn out to help develop the relationships between the characters. The characters really made the story read quickly, mostly because you actually liked most of them and wanted to read more about them. That made the story breeze by. In fact, when I stopped reading at some points, I was amazed to see how many pages I took down. The pacing is very close to perfect.Side Notes:1) Map. I really do believe that this trilogy needs a map insert in each novel. It's really hard to figure out where some of these places and locations are without a map to refer back too, and having to look on the computer is kind of distracting.2) Tie-Ins. You may need to have read both The Year of Rogue Dragons trilogy and The Haunted Lands trilogy to understand some of the things that are mentioned. There are some things that are referenced that occur in both those novels, and it would be a good idea to check them out to better understand some of the things.3) Gates of Madness by James Wyatt. Whisper of Venom also contains the third part of an event that is going to spread across the worlds of the Dungeons and Dragons novels. The first part is found in the paperback version of R. A. Salvatore's The Ghost King, the second part is found in Bill Slavicsek's The Mark of Nerath, and the third part is found in Jeff Mariotte's City Under the Sand. The final part is going to be found Lady Ruin by Tim Waggoner which is due out in December 2010. This part is titled “Pandemonium” and once again, it's interesting. However, I'm starting to get annoyed as to why these parts have to be in other stories and not just a novella. Because trying to recall the previous installment is getting a little annoying.4) Cover Art. The cover art for Whisper of Venom is really good and eye-catching. It's a pretty cool fight scene, with Aoth and Jet charging in at a green dragon with Gaedynn and Jhesrhi coming in as well. However, Aoth looks like a stone man. But that doesn't affect the overall appearance of the cover art. It's still a pretty dramatic scene. Overall: 5/5Final Thoughts:Whisper of Venom was a fun and exciting read. The biggest issue with the book was the lack of reintroducing elements and plot threads from the previous book. It did take sometime to recall who was who and what happened. However, after you remember some of these people, the books really does become wonderful. The characters were the highlight of the novel. They were just great. Nobody felt like they didn't belong or that they shouldn't have been there. The story itself was great in how it incorporated multiple storylines almost seamlessly. Finally, Whisper of Venom was very hard to put down for too long, with the fast pacing. You just wanted to keep reading without ever stopping. All in all, this a book that I highly recommend. However, I would suggest you having The Captive Flame fresh in your mind before starting. I really enjoyed this next entry in the series. Byers really knows his Realms and this series brings me further into an interesting situation with high fantasy and real stakes. Each of the five books of the "Griffon" is a story unto itself (my guess since i'm only in the 3rd).However, it is also part of a much broader "backstory" involving dragon games and Aoth's company.This allows the books to have a very unique personality, but also gives Richard Lee Byers the possibility to tell an epic tale (5 books is epic! ), without boring people to death with minor details, which some books that span for 5 titles fall into.Richard is one of my favourite authors, because of the amount of time he gives developing cultures portrayed in the books (undead, Thay, Dragons, dragon cabals, dragonborn, etc. ), without looking cumbersome to the reader.The story is very interesting and it is almost like watching a series (like grimm), where you have the main plot and every episode they unfold a bit more of the big picture, until you get the "a-ha" moment in the end.The characters are still superb, and he manages to bring the craziness (somewhat controlled) to Tchazzar. Jesrhi's disgust of touch is almost "palpable" when you read the descriptions of her interaction with tchazzar and you really wanna go there and punch the idiot dragon in the face, feeling sorry for her being forced to play a part in the whole intrigue that might end up being too much.I feel the grifforn Company brings us some of the best D&D books out there, and this is a must read. An excellent book, but like the rest of the Byers novels I've read, the editor seems to be a bit unclear on grammar rules. Aside from that, the story was fantastic and the final confrontations were very thrilling. I'm glad to see that the series will be continuing beyond the original trilogy. Aoth, Gaedynn, and the others are great characters, and I particularly love Medrash and Balasar. Though I loved the first book in this series, I had a bit of trouble getting into this one. The fact the main characters are mercenaries provides good conflict between what is good, and what the mercenary company needs to do to regain a positive reputation. This series just gets better and better. The plot advances and so does the threat level. I can't wait to start The Spectral Blaze. I love the way the battles develop and are described at a Army level of conflict. Now onto the final in the trilogy! Byers is a great author. Richard Lee Byers - A resident of the Tampa Bay area, Richard spends much of his leisure time fencing, playing poker, shooting pool and is a frequent guest at Florida science-fiction conventions. His current projects include new novels set in the Forgotten Realms universe and the eBook post-apocalyptic superhero series The Impostor.